But you don’t need to take my word for it…..because I went and broadcast my progress live from start to finish.! So back to Kimmy….why an elephant? Well that’s the easy bit. 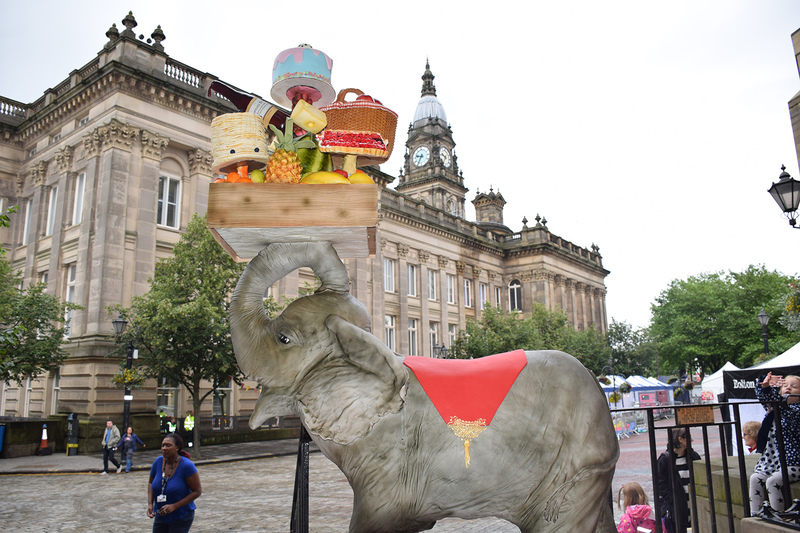 Bolton Council wanted a showpiece cake to star at their Annual food festival and Bolton has a historic connection with elephants. 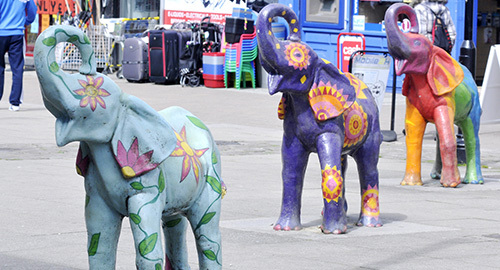 An elephant features on their coat of arms and from time to time decorated versions pop up around the town. 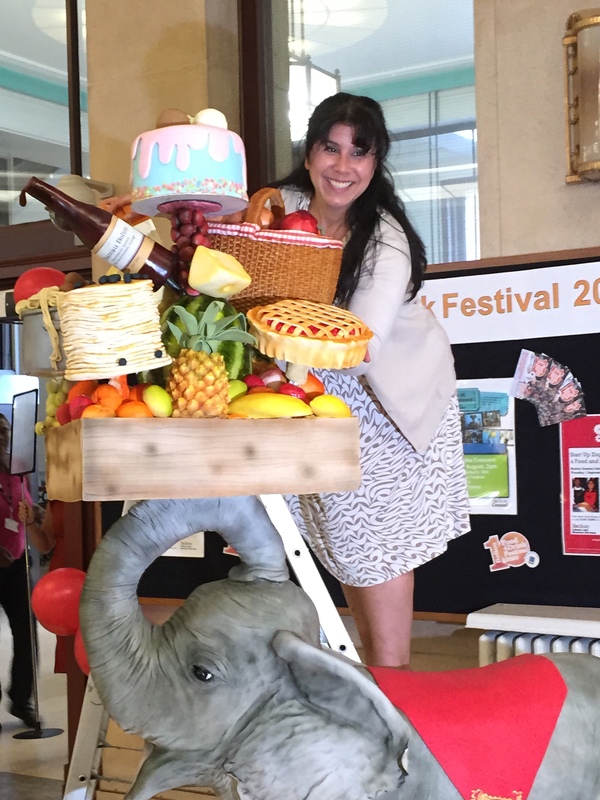 And of course….for a food festival…why not team an elephant up with a stack of food. Simples huh? But it is a little more thought through than that. We want to cover a whole lot of objectives with our li’l old cake. 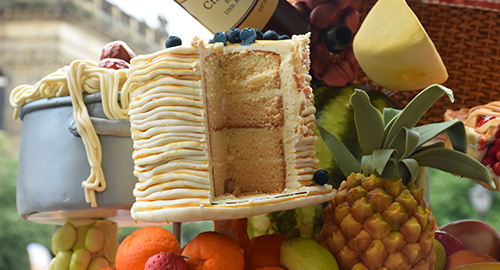 We want good PR, we want good press and most importantly….we want the cake to be enjoyed by the people of Bolton. So yeah….a great big elephant with the added height of a food tower….that’s gonna get good press. TICK. But then it gets a little more complicated. We’re not going to deliver the cake and dish it out. No no no! We are going to hang around for a few days. (four days to be exact). 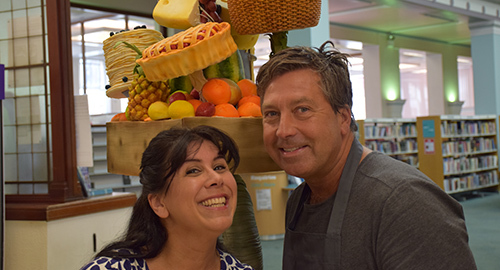 We are going to feed hundreds of people…..and then (no, it’s not over yet) we’re going to transport it to a charity so that it will be enjoyed by the whole community. So are you seeing the pitfalls yet? We have a cake (a massive cake) that is going to take a LOT of work (and more importantly time) to make….we are going to transport it (good luck with that one!!!). We are going to keep it hanging around (did I mention it’s summer?) and we are going to eat it (eventually! )… OH!…and do you remember the bit where I said it was CAKE??? So therein lies the problem my friends. We are dealing with perishables. 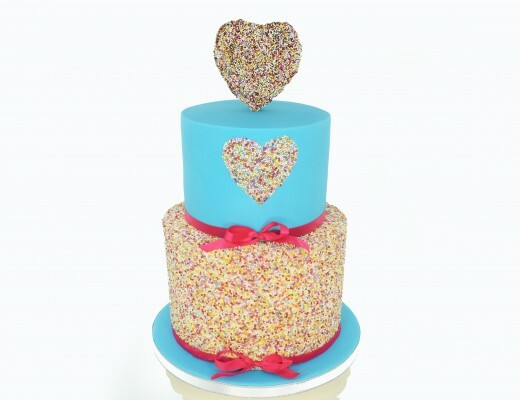 We know that the moment that cake goes in….the clock starts ticking (and boy does my clock seem to tick super fast!). So planning becomes everything. (Or should I say planning AND COFFEE become everything?). 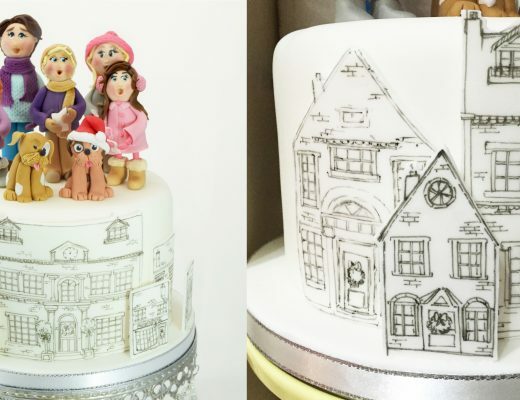 The cake structure deserves it’s own blog….In fact….watch this space….I’ll bring that to you in much more detail in my next post. (I know people wanna see.) In the meantime it stands to reason that the structure is a WHOLE lotta work in itself …I am TOTALLY making it all up….from sketches and ideas…to a 2.2m frame to the final sculpture….all from my messed up little brain. The process isn’t one I could explain to myself….let alone to anyone else! So to the cake nitty gritty: I have to plan when to start exposing the cake. 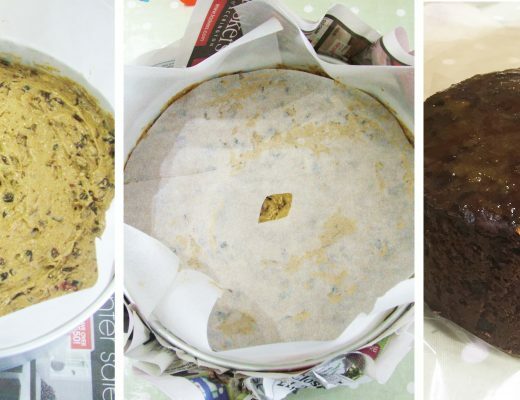 It’s great cake…bought in from a specialist and I’ve used it before….so I know what I’m dealing with and how long it will stay fresh. 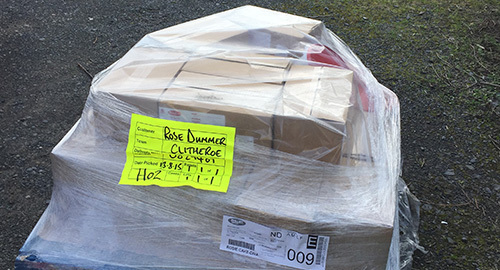 I allow 6 days before delivery to start loading the perishables….The cake, the chocolate ganache, the buttercream etc. With generous sponsorship from Renshaw baking I have a pallet full of goodies to work with. And I’m gonna need it! But yeah….the perishable issue….it’s a minefield…and again…I will cover that properly in my next post….but suffice it to say…planning, hygiene, storage, transport….it all needs to be thought through meticulously. So how much stuff (aka ingredients)? I’ll be honest….I lost track a little. My bad! 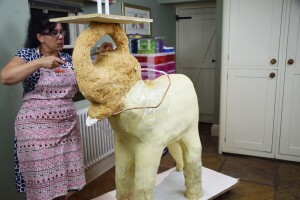 I had 150kg sugarpaste and there aint much left, 20kg chocolate and as for rice krispie treat?? Well I know I made 45 batches, each of 500g!! 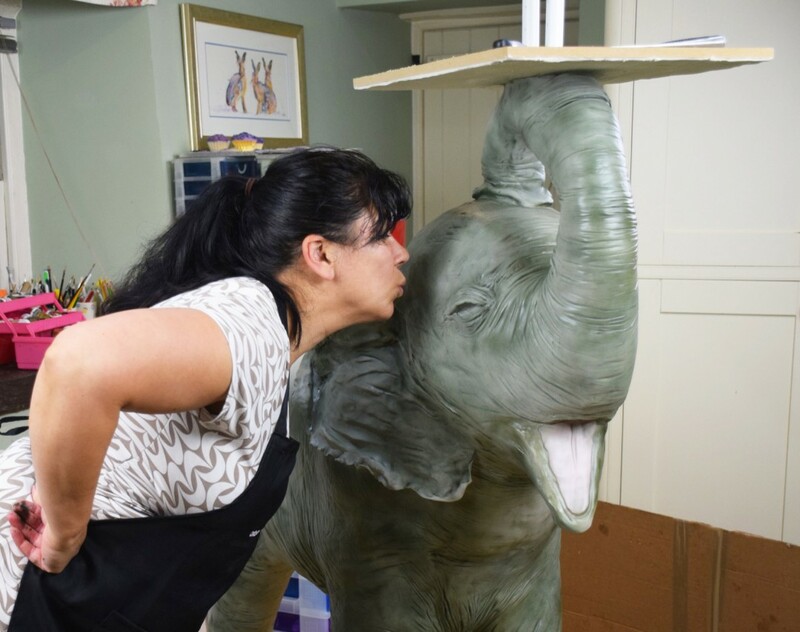 So yup….the Elephant was no featherweight. And ooooh…did I mention the food tower? Yeah….let’s not forget the whole OTHER cake sculpture that had to be done. I will admit…when I planned it all I very much assumed that the spaghetti wouldn’t happen….the grapes…the strawberries (all cake by the way) – I figured they were a nice option which I wouldn’t have time for. And yet…..you guessed it….when faced with not doing them……or not sleeping….sleep lost! Of course it did! Hence my 5am Periscope broadcasts to anyone who fancied propping me up at that ludicrous hour! So I said I’d fill you in on the ‘Scoping’. What’s the deal with that? Well Periscope is pretty new. It’s like Twitter and YouTube and Facebook….but kinda rolled into one. You register a free account (just like the other social media) and then you can broadcast live….or just watch! Watch anyone….and anything….anywhere. People walking down the pavement (yeah…that’s as dull as it sounds) or crazy people making cake elephants (that’s more like it!). And the proof of the pudding? 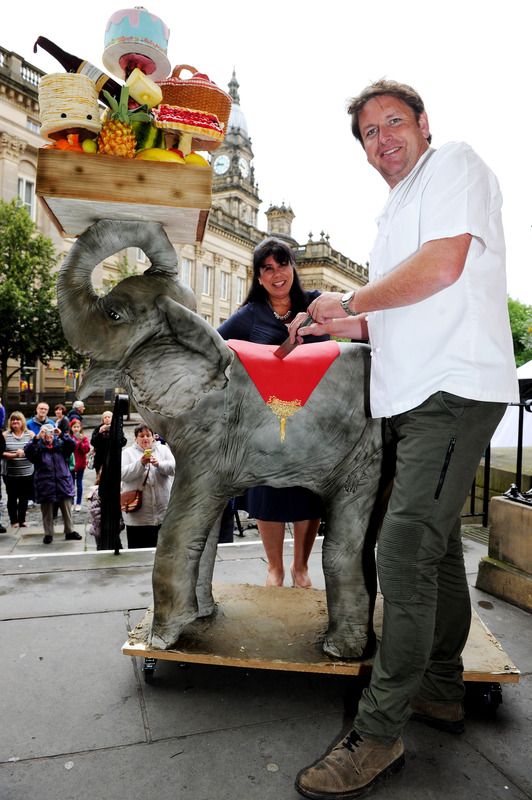 Unveiling a 2.2m elephant to the town of Bolton with a whole Periscope family behind me felt as though I had a whole bunch of people who ABSOLUTLEY understood what I’d invested into that creation. It was fantastic to have them there. 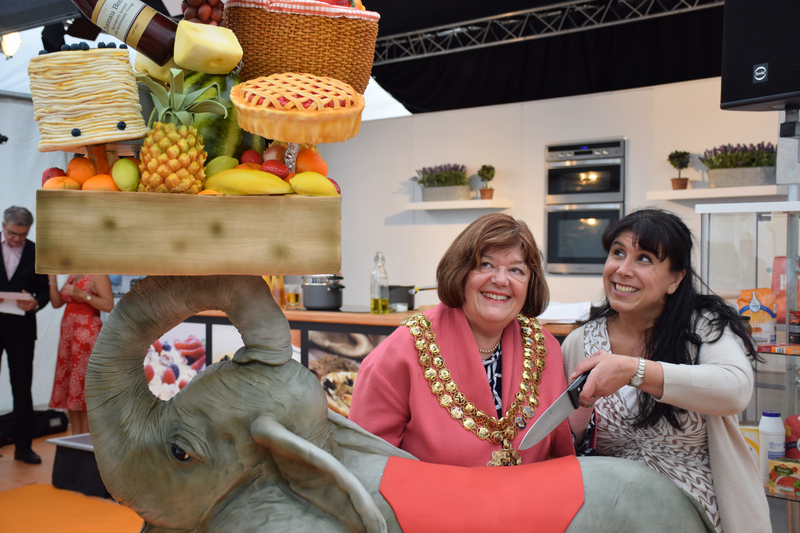 From the celebrity chefs who came to cut her….to the people of Bolton joining in the fun and dishing out the cake. Kimmy finally went to Urban Outreach, a local charity that ensured that children and families in need got to share the cake and enjoy the community spirit. Well done Bolton. Pop back next week when I’ll bring you all the secrets behind the construction of a mega-cake. Gluten Free Vegan Brownies to die for! Please choose whether you would like to enter the UK or the USA version of my website.